The Max branded smartphones from Asus are known for their high battery backup. 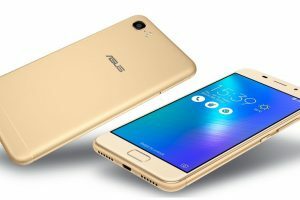 Max branded smartphone in Zenfone 3 series also features an excellent battery capacity similar to its predecessors and stands out among its competitors in this category. Released in November 2016 V5 is priced at Rs. 18,100/-. The Max 5.2-inch (ZC520TL) display version, is priced at Rs. 12,999, while the 5.5-inch display version (ZC553KL), is priced at Rs. 17,999. 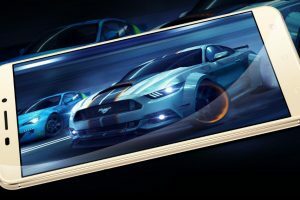 Vivo V5 features 1.5 GHz octa-core MediaTek MT6750 processor supported with a 4GB RAM & 32GB internal storage with expandable storage up to 128 GB. 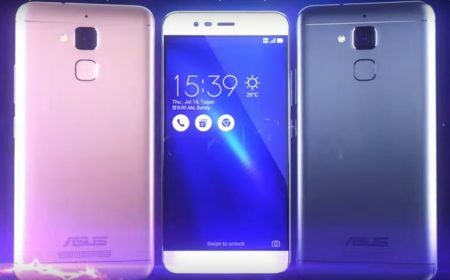 Zenfone 3, on the other hand, features a Qualcomm MSM8937 Snapdragon 430 chipset powered by a 4GB RAM with an internal memory of 32GB expandable up to 256 GB on a micro SD card. Camera: Zenfone 3 Max ((ZC553KL)) features a 16 MP rear camera with f/2.0 and phase detection & laser autofocus supported by a dual-LED (dual tone) flash, panorama, HDR options and supports Video recording at 1080p at 30fps. In the front, the Max sports a 8 MP camera with f/2.2. 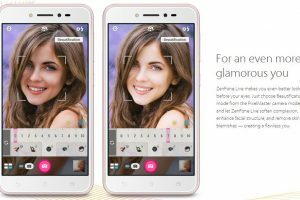 On the other hand, V5 is a selfie-centric smartphone with 13 MP rear camera and 20MP front camera. Camera features include phase detection autofocus, LED flash Features, panorama, HDR, Video 1080p@30fps. 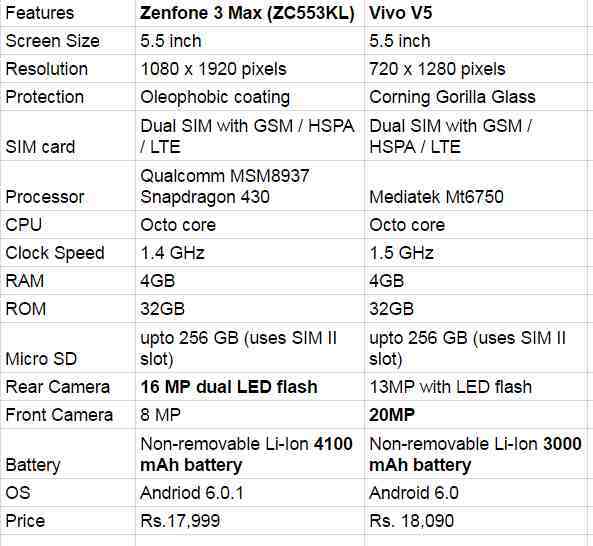 If you are selfie freak, then V5 wins the race among the two. Max, however, gains the upper hand when the battery capacity of the two is compared. And if you are looking for a great battery backup smartphone with no compromise on features, Zenfone 3 Max is the smartphone to go!